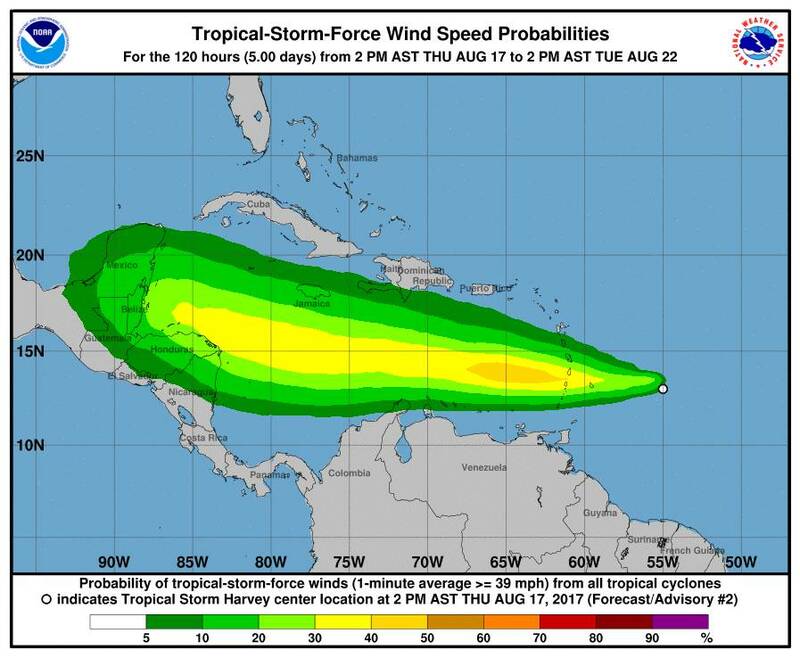 The National Disaster Management Agency (NaDMA) with the technical assistance of the Meteorological Office at the Maurice Bishop International Airport is monitoring Tropical Storm Harvey. At 5 pm, Tropical Storm Harvey was located 13.0° N, 55.8° W or 626 km (389 miles) ENE of Grenada. Harvey is moving towards the west near 18 mph (30 km/h), and this motion is expected to continue for the next couple of days. On the forecast track, Harvey should move through the Windward Islands and into the eastern Caribbean Sea on Friday morning, with its centre passing near St Vincent. Reports from an Air Force Reserve Hurricane Hunter Aircraft indicate that maximum sustained winds are near 40 mph (65 km/h) with higher gusts. Slow strengthening is possible during the next 48 hours. Tropical-storm-force winds extend outward up to 35 miles (55 km) to the north of the centre. Grenada, Carriacou and Petite Martinique can expect mostly cloudy conditions with scattered showers (which may become heavy) and possible thundershowers accompanied by gusty winds overnight and Friday morning, mainly in the northern sector and mountainous areas. A marine advisory for sea users remains in place and residents in flood prone areas are asked to take necessary precautions. Grenada, Carriacou and Petite Martinique are not under Tropical Storm Warning or Watch. The next update will be at 11 pm tonight. For additional information, please contact NaDMA on 440-8390-4 & 440-0838, or email: nadma@spiceisle.com. NaDMA, the official source for all disaster related information in Grenada.